Featuring “Spider Foam” technology for an overall cooler pad! 3D High Definition 6.5 inch Foam Pads, available in 3 different variations, feature a “spider” cut design that allows for more product absorption, cooler pad temperatures, and an increased polishing area. These durable, high performance pads feature a tear resistant, long lasting foam that will last longer than many other pads on the market today. When using 3D HD Speed or 3D HD Cut, you want the highest performance possible, and the 3D High Definition 6.5 inch Foam Pads give you just that! 6.5 inch 3D Foam Pads feature a spider cut design that allows the air to flow through the foam, reducing heat and increasing pad durability. 3D High Definition 6.5 inch Foam Pads feature a tapered design for an enhanced surface contact area. The spider cut design allows the air to flow through the foam, reducing heat and increasing pad durability. Available in a cutting, polishing, and finishing pad, 3D High Definition 6.5 inch Foam Pads keep it simple by providing a pad for every step! 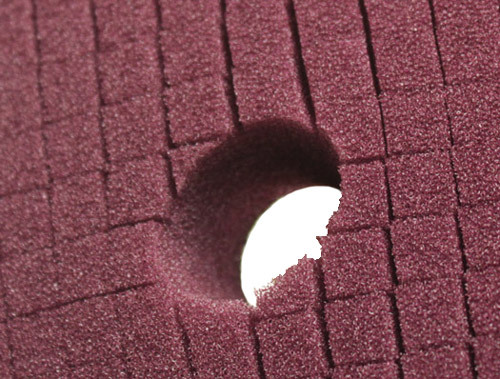 Dark Purple Heavy Cutting Pad – This is 3D’s most aggressive foam cutting pad and will quickly remove oxidation, swirls, scratches, and more, while still finishing nicely. Perfect for use with a compound like 3D HD Cut, the Dark Purple Heavy Cutting Pad is the first pad you’ll use in a paint correction detail. Light Purple Polishing Pad – Considered 3D’s most versatile pad, the Light Purple Polishing Pad removes light swirls and scratches, while providing a high gloss finish. Use with 3D HD Speed for a perfect all-in-one polish and protect. As the pad starts to work it begins to soften, almost instantly, increasing the workable surface area and providing balanced feel. Black Foam Finishing Pad – The finest and softest pad in the 3D pad line-up, the Black Foam Finishing Pad will remove light to moderate paint defects while also providing a superior High Definition shine. Use the Black Foam Finishing Pad with a finishing product like 3D HD Poxy for the perfect finish. If you’ve already got the 3D Car Care Products, make sure you have the 3D High Definition 6.5 inch Foam Pads to complete the ultimate 3D detailing experience!